Have you found an online vendor selling El Dorado 12-Year? Demerara Distillers of Guyana produces El Dorado 12-year rum and is the country's last remaining distillery, with origins tracing back to 1670. The name ""El Dorado"" references the legendary city of gold that is said to be in the country's Rupununi region. I do like sweet rums, and this one is like a spicy brown sugar rum happiness. It’s woodsy with some oak. Relatively heavy weight - not syrup but in that direction. Short slightly sour finish isn’t the best but Ok. Not overly complex but easy sipper. Would be great for someone just getting started on rum. This rum is very excellent in the glass and the nose is very smooth. First sip will hit your mouth with baking spice and orange peel with a hint of other fruits. The spice calms down a bit and leaves a lovely caramel flavor coating on the tongue. Burn is very minimal and is a very smooth rum. The price makes this one hard to not keep in stock! I've never tried it with ice or mixed, but I imagine both would work well! Very very fruity noise, hit of vanilla too, kind of smelled like a punch, a 10 for the smell for me. Then very sweet, could be too much for some. 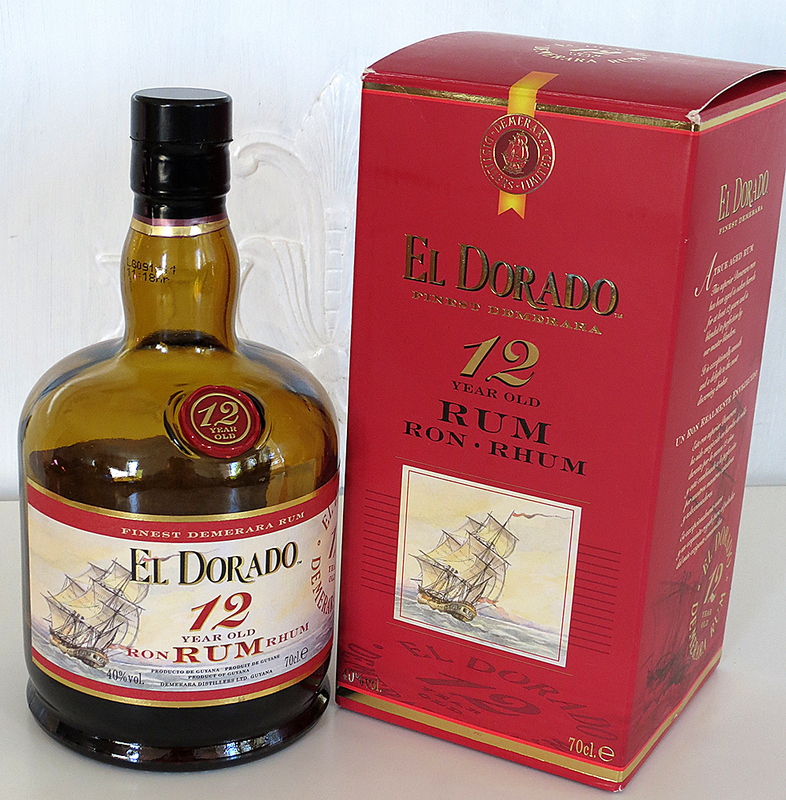 El Dorado 12 comes in a classical bottle and the rum is delivered in a simple paper carton (picture). When you smell El Dorado 12 you first sense som sticky alcohol but give the rum a few minutes in the glass and you get sweet aromas from fruit, honey and sugar. I the mouth El Dorado 12 is sweet, smooth with fruit and caramel. You also get some spice and oak. This rum easy to drink, not to much of anything. Very well balanced. The aftertaste is long and sweet with some spice and oak. In my world this rum is a nice sipper and the perfect blender. One of the best rums in this price range and I will always have one bottle in my collection. I drink El Dorado 12 with cola. I haven´t found any better rum to blend with cola (yet). And the opinion that it doesn't compare favorably to the 15 yr is not shared by many - in addition to myself, at least half the serious rum critics and aficionados I know of prefer the 12 year, though IMO the margin is slim and I love both. However, given the difference in price I see no reason to buy the 15 yr.
One thing to note - the 12 and 15 yr are completely different rums, with different components from the variety of stills used by Demerara Distillers. Edit : I have recently knocked my rating of this rum down a couple points since I found out that it has a ridiculous amount of added sugar - 45 g/ltr, the most among any rums on the Swedish national list. The 15 yr has less sugar at 31 g/ltr, but still a substantial amount. I still like the rum quite a bit, and the potent flavors are not overwhelmed by the added sugar - but cannot in good conscience give it the 9 I formerly had knowing that it has been sweetened so much. This is a great rum! I like the El Dorado rums. This one is one of the best rums you can get to the cost. So much sweetnes an flavour. Much fruit in the taste. The introduction of ED 8 kind of renders this bottle moot, in my opinion. ED 8 is less expensive and, on my palette, slightly more complex and interesting. And the ED12 just doesn't stand up to the only slightly more expensive bottle of ED15 with its caramelly wonderfulness. Save a few dollars elsewhere in your life and trade up to ED 15; or, have twice as much fun with a pair of bottles of ED8. As my 1st purchase of an aged rum..I have to say I did pretty good. Find it smooth with little after taste. I especially like it with a single cube of ice in it. Really like this rum but we'll see how it stands up in the long term after I've sampled some finer rums. Nice sweetness and smoother in my opinion then the 15 year rum by El Dorado. Sipped straight and was very pleased with the taste. Had to have it shipped from Brooklyn, New York as Pennsylvania State Controlled Liquor Stores had a 6 bottle minimum. This rum was a present from a friend of mine. In the beginning it tastes strong, now i drink it for a few times and read a lot about rum on the internet and i starter to appriciate this rum. I taste tones of vanilla and orange, some oak and something verry nice what i cant describe. For a beginner rum is this a good one and i feel like this rum starts the rum adventure for me. Too much sugar for me, but if your into the smooth and sweet your going to like it. Think the opposite of funky dry Jamaican. If your idea of rum is a mixed cocktail but would like to have a sipping neat rum this is probably a safe bet. Once was enough for me, I'll never buy it again. Elsewhere I review El Dorado 15-year rum and found it to be an excellent all-around rum. 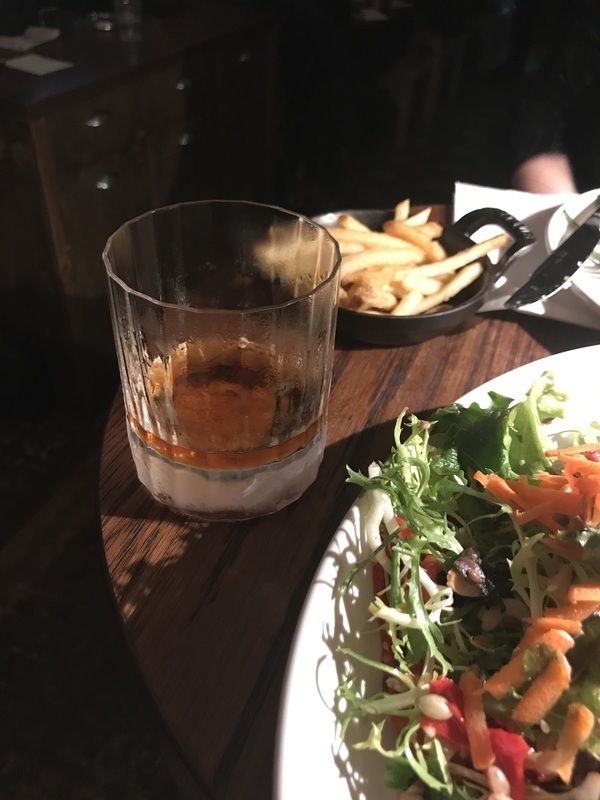 However if you cannot find the 15-year rum, it's younger brother, the 12-year rum isn't anything but a half-step sideways. There may be the law of diminishing returns in effect between the 12-year and the 15-year rum. I find both to be outstanding but even my uninformed palate can detect some differences. Whereas I find the 15-year to be not as sweet as some claim, the 12-year definitely has a sweetness with lingering hints of vanilla. Makes me want to take another sip. As with the 15-year rum, the 12-year rum works well with anything...mixed drinks, sodas, on ice, straight. Frankly, you won't be disappointed with either. When opening the botlle you smell something sweet. It looks like the honeybee brought a fresh load of honey. At first you taste a sweet and strong rumtaste. When you hold the rum in your mouth the magic happens. The afterkick of the honey flavour is a experience to remember. Prior to purchasing the 12-year old El Dorado I have bought the 15-year old. Having read many reviews with some people saying they prefer the 12 to the 15 I thought the two rums were at least en par. Compared to the ED 15, it's hands down just not as nice. The 15 is much more complex and has a lot more body to it. Edit: It's best on the rocks. It's no secret quite a bit of sugar is added to this one. As shown by more serious drinkers/reviewers and their hydrometer tests. Such knowledge will influence your judgement when drinking but luckily I tasted the El Dorado before reading about it. And yes, it is clearly overly sweet. Most of my drinking buddies agree. I think it aims to a part of the (novice) market that thinks rums should taste like this, because, after all, the stuff is made from sugar cane. If you are looking for a smooth, sweet rum you are better off with the Diplomatico Exclusiva or the Zacapa 23. I found the El Dorado 12 quite monotonous. Aroma: Ve vůni mi jako nejvýraznější přijde kořenitost, a to hřebíček, ale s přechodem (při hlubším zkoumání) až celer, libeček, taková ta polévková kořenitost, skoro bujón. Chuť: Chuť je fantastická, nejsladší ze zatím ochutnaných rumů, a vůbec mi ta krásná medová sladkost po rozinkách nevadila,takový nektar, který má zajímavé kořenité dokončení, opět se vkrádá hřebíček s celerem. Has some nice flavors but the absurd amount of added sugar masks what otherwise may have been good rum. El Dorado is notorious for sugaring their rums far beyond any reasonable standard...so who knows what this rum really tastes like, without the added sweeteners and coloring agents? I don't know how this rum won any prices with so much added sugar. It's not a bad rum, whole profile is quite basic (similar to zacapas) but that added syrap sweetnes is a real turn off. Maybe for a teenager taking first sips of alcohol this can be very nice experience but for a grown up man - no, no, no. As my rum palate has developed I have found this rum to taste better and better. It seems to me like a sweet finishing whiskey, that smells much sweeter. I find oak and Carmel on the front, but sweet vanilla and toffee on the finish. Mellow sipping rum, but not as mellow or sweet as the 15 year. I like the 15 more, but if you aren't a fan of sweet rum the 12 is a great choice. Little bit sharp. Not so balanced. Not bad, not excellent. Absolutely my favorite Rum. I get a sweet woody spice taste with hints of fruit and a mild warm finish. My review of the El Dorado 15 year old was actually a comparison with the 12 year old. I purchased this rum after reading another review suggesting it was even better than the 15 year old. I would say that my taste differs than that reviewer. I felt the 12 was much harsher on the palate and even the aroma was much harder on the nose. It is a nice rum but fails in comparison to the 15. I tried both neat and on ice. I would not even consider using the 15 in a mixed drink and would prefer not to use the 12 but it would be rhe more likely choice if I did. Sugar: 35 gpl. Updated August 24, 2017. This is a very good entry level sipper. It's sweetness, spice and smoothness is well balanced, and the strong oak and whisky-bourbon taste has grown on me in subsequent tastings. In comparison to the other aged El Dorado rums, I think the 12 year old has a better taste than the 15 year, but the 21 is their best so far for me. Keep in mind that the 21 Year old version is sweeter and you can buy 3 bottles of the 12 year old for the price of one bottle of the 21 year old, which makes the 12 Year Old a great value. Was really looking forward to this one but didn't totally do it for me. The first thing that got me was the incredible chemical like aroma. Reminded me of my Dad's plastic model glue. While not a terrible smell, it was the strength of it that caught me off guard. It has more of a burn than some of my favorite, couldn't drink this all night but pleased I picked a bottle up. Finishes with a nice caramel aftertaste.